I pulled out 3 eggs from the fridge and left them come down to room temperature overnight. I had no figs and was too tired to go buy them at 10pm…so decided to bake the pudding the next morning anyway and serve it with mango! 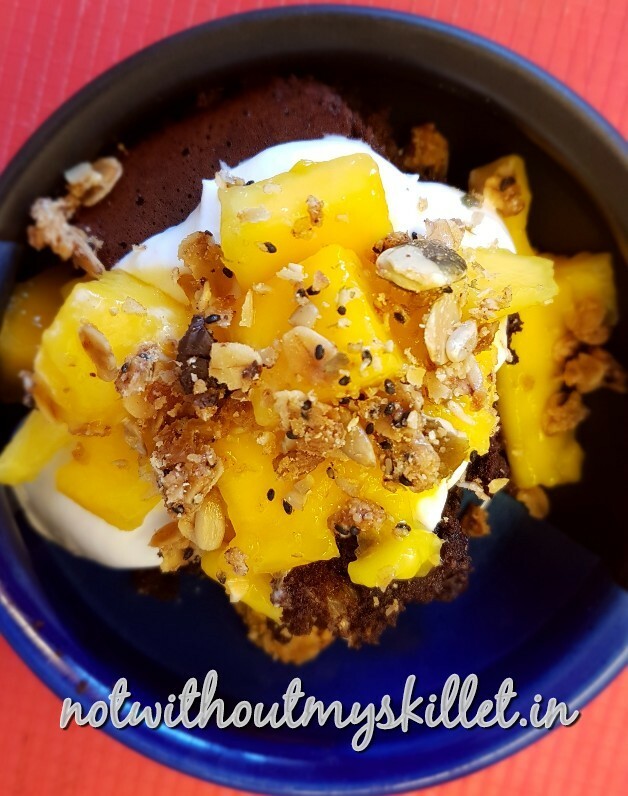 It is mango season after all…and since we don’t quite like cashew cream, as was used on the show, I decided to go with cream cheese and soya cream mixture to add that lusciousness to an already brilliant bake…I mean chocolate, cream cheese and mango is a match made in heaven, isn’t it? 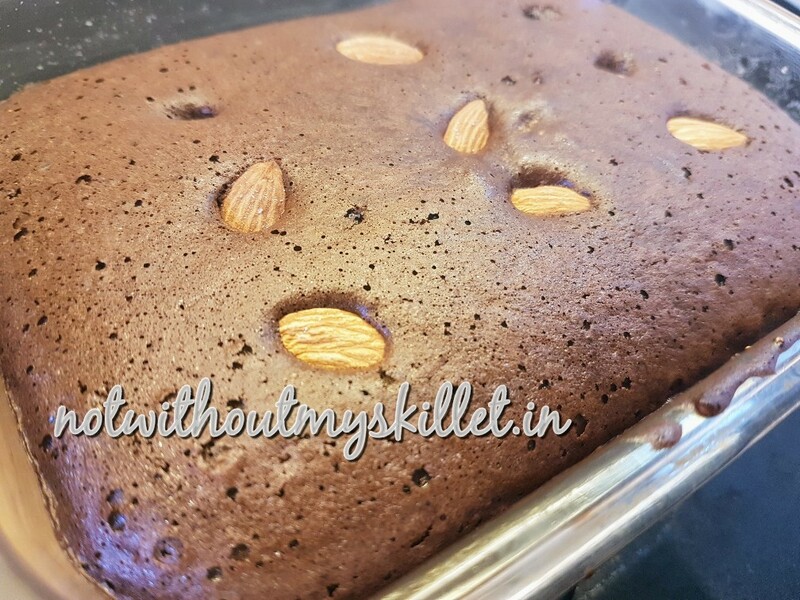 What’s more i had some dry fruit and evaporated milk filling left over from the dry fruit and khoya pastry I had made last weekend…that would do insanely well with my chocolate pudding. That’s it in the recipe was set..it would be ready for lunch the next day in time to go with my prawns wraps, lettuce and mango salsa, cauliflower mash and lemon and tarragon grilled spotted seer fish (surmai). 4 tablespoons date syrup (I use Lion) You can also use palm sugar. 1. Pre-heat the oven at 180 degree Centigrade. Beat the eggs in a squeaky clean metal or glass bowl, till the eggs have risen well. 2. Add the sieved chocolate powder, baking powder, vanilla essence and the date syrup. Mix it lightly so you don’t lose much of the aeration. 3. Add a touch of salt to bring out the sweetness and the dry fruit mix if using. 4. Mix to incorporate the salt and pour it into a buttered baking dish. I’ve used a glass dish here. Add roasted almonds on top. If you’re using figs this is when you should layer the chocolate pudding with chopped figs. 5. Bake the pudding for 25-30 minutes depending on the oven and dish used. This pudding is delicious eaten without any of the toppings too! 6. 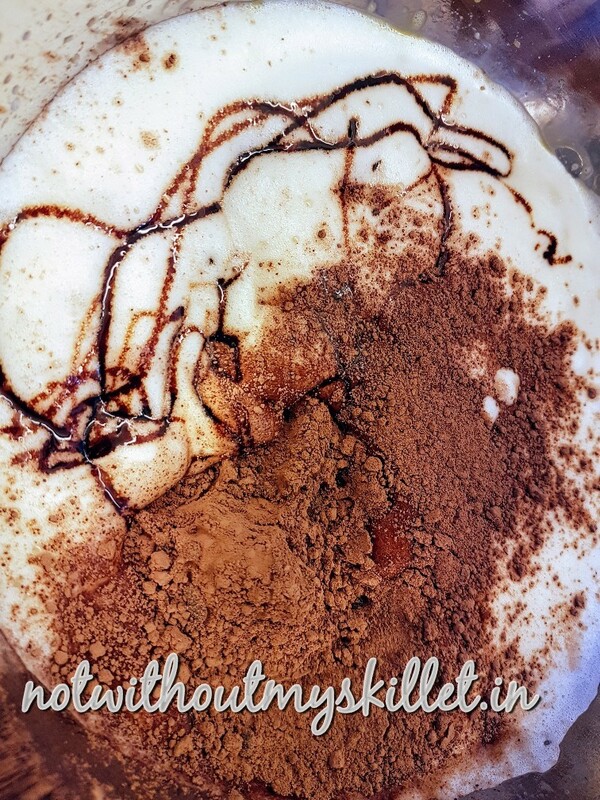 Beat the cream cheese and soya cream together to get a creamy consistency. 7. Peel and chop the mangoes into bite size. 8. To serve: scoop out the pudding, place the chopped mangoes over it, pour the soya-cream-cheese mix over it and top with crumbled granola bar! 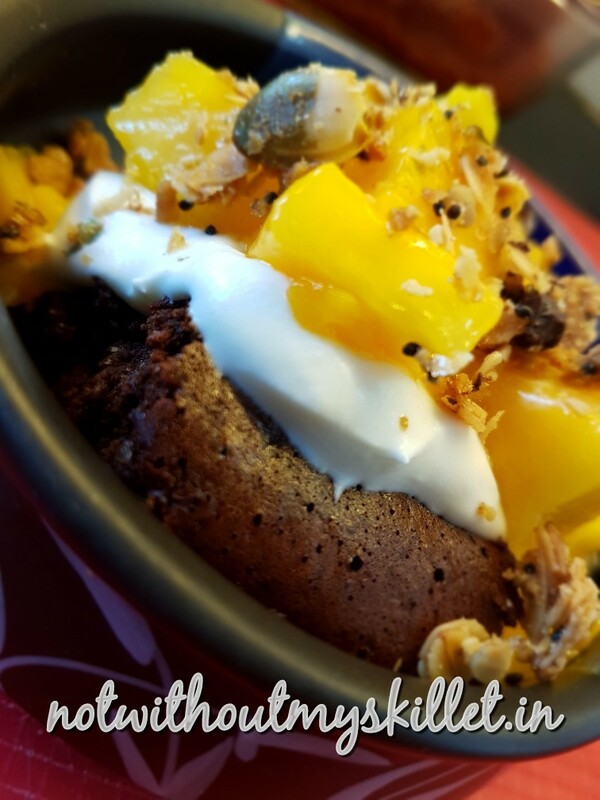 Enjoy your delicious Mango and Chocolate sugar-free, flourless pudding! My new favourite chocolate pudding!